It was almost 15-20 minutes after the race started when we left the Parking Area. After being shouted at by the Traffic Marshal as we merged to the road, we moved on with a slow speed. I didn’t mind being shout at as it was a result of misinterpretation of the hand signal of the Marshal. Our main focus was to support Tess Leono and I have also the habit to shout at runners who are trying or observed to be violating my race rules and regulations. Tess was already far from our sight as we moved on the first 200 meters of the route. Actually, we could no longer see her back! The temperature was still 120 degrees Fahrenheit and there was no sign that the heat is beginning to cool down even if the sun is about to set from the west horizon. It was already “early evening twilight” when we saw the back of Tess on the left side of the road. She was not on the back of the pack as we advised her to be easy and slow on this section of the route but we were surprised to see her at the middle of the pack! • Advise her to slow down within the first 5-kilometer stretch and advise her of the 12:3 ratio of run and walk (12 minutes of run/jog and 3 minutes of walk). She can lower her speed to 7 kilometers per hour. • At Km 11, she had her first pee and she slowed down to a speed of 8 kilometers per Hour. 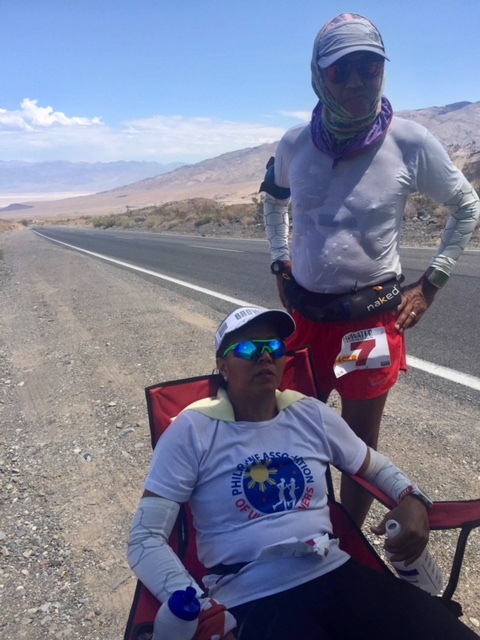 • She started to ask for a change of Shoes at Km 12 but when I asked why she was changing on the early part of the race, she changed her mind and decided not to push through. • Told her to take some bite foods at Km 12 and she did. At this point, she was relaxed on her pace but she was still sweating profusely. • At 9:00 P.M it was still 113 degrees Fahrenheit in temperature (as glanced from the Vehicle Controls)! • She asked for her Chamois cloth at km 16.8. 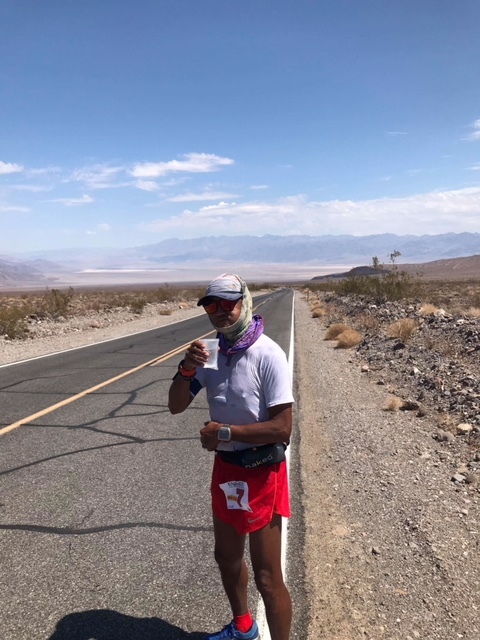 Tess was very fast on the early section from the Start to Furnace Creek Time Station @ Mile 17.5 (Start To Mile 17.5) but she apparently slowed down on the later half of the section due to many stops and refill/exchange of her Simple Hydration Bottle with Ice Cold Water. She was holding/carrying only one bottle at a time during the run. However, I have observed that most of the 16 fluid ounces of ice cold water was being poured on her head. We reached the Time Station at Furnace Creek at 4:18+ minutes without any mandatory cut-off time at this point. 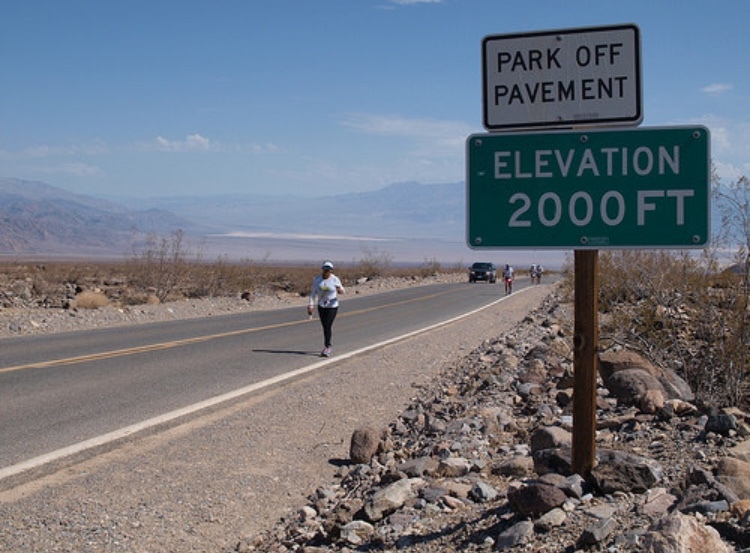 It was in this Time Station (Furnace Creek) that she asked for a seat and a change of her shoes. In an instant after she sat, she was already having muscle cramps on her legs. We wanted to stretch or massage her legs but she shouted at us with “Don’t touch me!” Ok, fine…She was sweating profusely and we gave her a lot of water in her hydration bottle but I have observed that she would pour the ice cold water on her legs! Ok…I thought, maybe she wanted to have her 2XU long tights to be wet with cold water. Later on, she asked for a pair of scissors. What? For what is the scissors? Khris gave her the pair of scissors and she was cutting the lower part of her tights in a vertical manner. I only suspect that the tights was putting a lot of pressure/compression on her ankle and calf muscles. She felt relieved when she made some cuts on her tights. Later, I found out from her that it was her first time to use this new 2XU tights. I thought she was using her old tights for this event. We gave her the food that she asked at this point. In a few seconds after the pouring of ice cold water on her tights/legs, cutting her tights, and eating some foods/drinking some water and Coke, she was back on the road. It was her request that we should stop whenever we see her on the road. In my estimate it would take us a few minutes from the time we prepare her next supply of water and food before we move from where we stopped up to the time we see her on the road. Sometimes, she would run, at least, one kilometer before we would look for a parking space on the side/shoulder of the road. As a driver, it was very tricky to look for a wide and stable space on the shoulder/side of the road. There are times that the shoulder is very loose with small rocks/sand that you don’t want your tires to go deep on those loose sand and rocks. The RD had advised us not to suddenly brake on these loose shoulders once we park our Support Vehicle as some of the vehicles would be sucked on the side of the road. It is also automatic that we would slowly drive our vehicle out of the shoulder when we leave. There is no rush in parking and leaving the parking area. We could no longer count how many times we parked at the shoulder of the road of which we don’t have to. But it was difficult for us to have a nap or have time to rest and wait for Tess as she approaches our Support Vehicle as soon as we park our Support Vehicle on the shoulder. This park-support-leave cycle was repeated every almost one kilometer to one mile until it was sunrise. 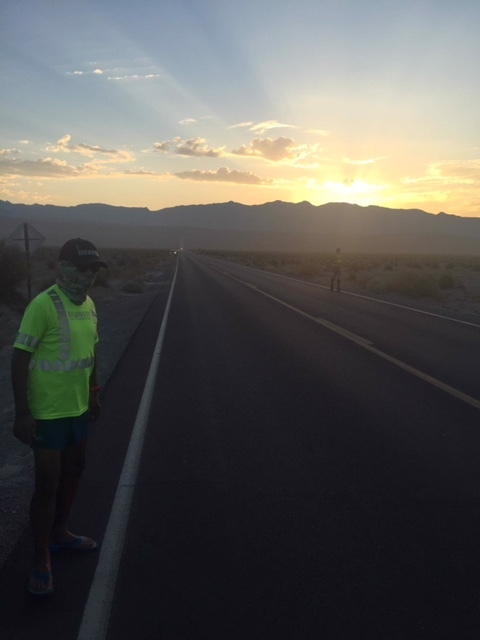 At the break of dawn, we would see a lot of runners and Support Vehicles passing us and they are the runners that started with the Second Wave at 9:00 PM. Tess would continue with her run and walk, and she was back with her good running condition. 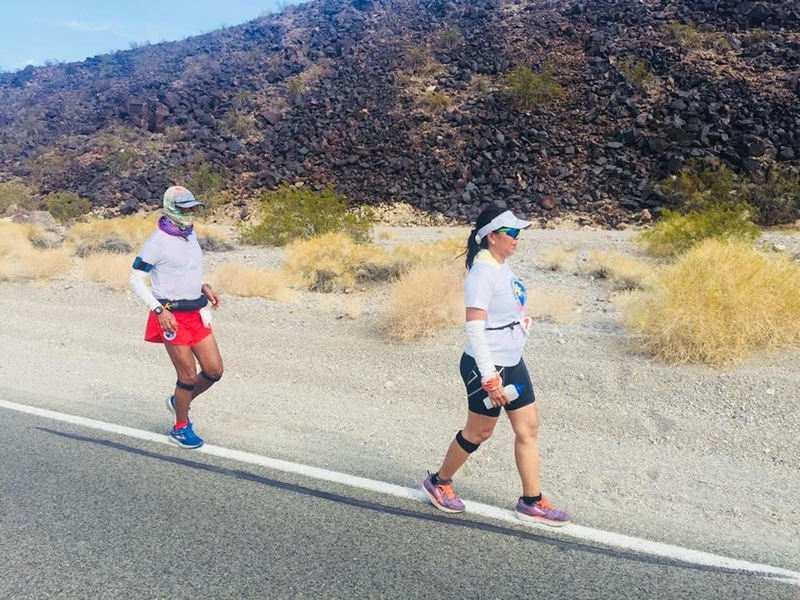 It was a matter of time before we reached Stovepipe Wells at Mile 40 as Tess would move progressively forward with the rest of the runners. The heat temperature had lowered in the early morning of Monday but it went as high as 120 degrees Fahrenheit as early as 9:00 AM. As the runners relentlessly moved forward, the heat of the sun and the winds had also relentlessly became hotter and stronger. At a distance, we could see already the building structures of Stovepipe Wells. It was time to prepare myself as the Pacer of Tess once she reaches the Stovepipe Wells General Store. • Started to pace her at Stovepipe Wells General Store. We power hiked the uphill up to the Time Station where the RD was waiting which is still 8 miles away from the center of SP Wells. The RD was located at the 2,000 Feet Elevation Sign on the left side of the road. 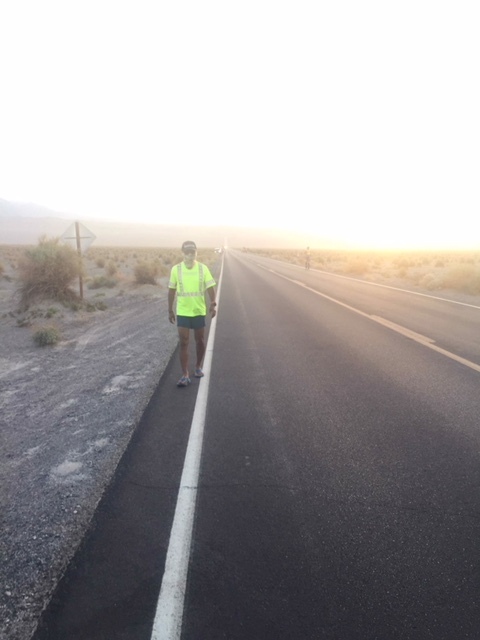 At this point, the RD told us that we missed the 10:00 AM cut off time by 9 minutes but he told us that we just proceed to Panamint Springs and be able to recover the negative time we had. It was time to push Tess to jog and hike the uphill climb to the peak of Towne Pass. At this point, the Elite Group who are with Wave 3 started to pass us and I observed that they consistently jogged on the road which is to my estimate is 5-15% gradient. I tried to jog behind Tess and I felt comfortable. While I slowly jogged behind her. • Since I don’t want that our crew would also assist me on my needs from the Support Vehicle, I asked them to aid and concentrate on helping Tess on her needs once we approached our parked Support Vehicle. There are times when Tess would simply leave me as I was still refilling my bottles and chewing my solid foods. Most of the time, she would be 50-60 meters ahead of me and I have to jog the uphill climb just to be able to be directly positioned behind her. It would take me almost one minute to jog the distance where Tess is located. • Early on, I taught her run while counting on her strides. I told her that we should do the “20/20 strides”—-20 strides on the run & 20 strides while walking. We did this kind of run & walking ratio on our way to. Panamint Springs. I also taught her to power hike as if she was race walking! • After we crested the peak of Towne Pass, I was confident that the downhill route to Panamint Springs will provide us the confidence of a faster pace and speed. But I was wrong!